This is an accurate replica of the 1902 Pattern MK II 90 Round Bandoleer. These bandoleers were worn by the famous Light Horse troops. The troopers usually wore a bandoleer across the shoulder and two or more around the horse's neck. The number of bandoleers a trooper would carry would largely depend on the field of operation and the distance from re-supply. 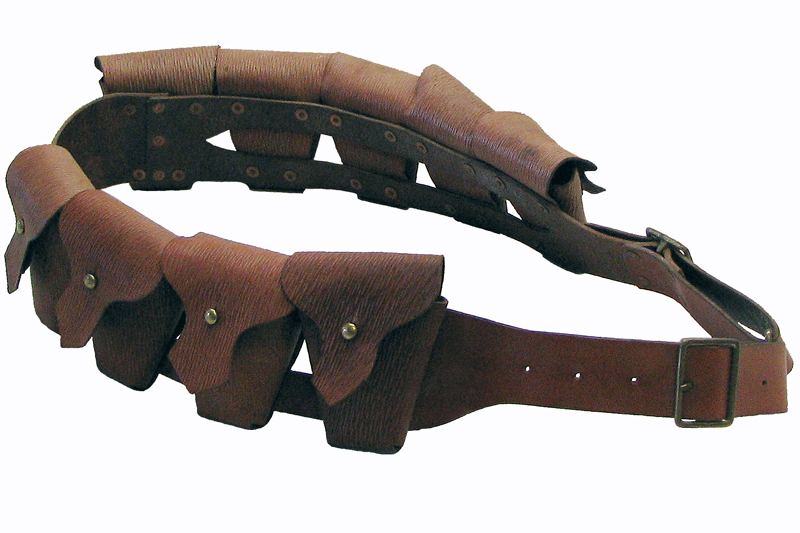 The bandoleer is made from high quality vegetable tanned leather and the fittings are solid brass replicas of original period fittings. The ammunition pockets are a lighter weight leather printed with willow grain pattern of the period. Please Note:These bandoleers are made to order only and take 2-3 weeks to deliver.